GRILL DIRECTIONS: Heat grill. In blender container or food processor bowl with metal blade, combine tartar sauce ingredients; blend at high speed until well mixed, stopping often to scrape down sides. Place in serving bowl; refrigerate. In small bowl, combine oil and lemon juice; mix well. 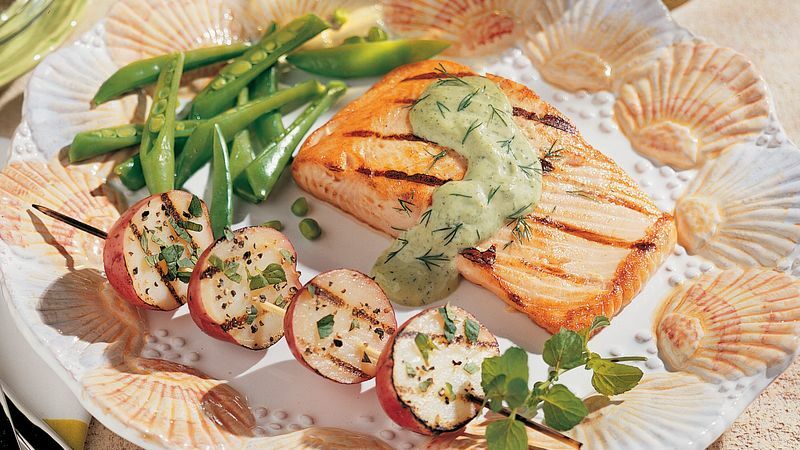 When ready to grill, brush salmon fillets with lemon mixture; sprinkle with salt and pepper. Carefully oil grill rack. Place fish on gas grill over medium heat or on charcoal grill 4 to 6 inches from medium coals. Cook 8 to 12 minutes or until fish flakes easily with fork, turning once. Serve with herbed tartar sauce. To broil, place food on broiler pan and broil 4 to 6 inches from heat using time provided above as a guide. Foods cooked on a covered grill take on a light woodsy taste and smoky flavor when dampened wood chips are scattered over hot coals. Hardwoods or fruit woods are the best types to use. Avoid cedar, fir, pine, spruce and eucalyptus, which give food an unpleasant resinous taste. Choose from the following: Fruit Woods-- Delicate and sweet. Best for poultry, seafood and pork. Grapevine--Delicate and sweet. Best for delicate fish or poultry. Hickory--Popular, intense and smoky. Best for robust food such as ribs, poulty, beef. Mesquite--Light, clean and woody. Best for meats compatible with strong flavor, such as beef, chicken and swordfish. Nut Woods-- Delicate and sweet. Best for poulty and dark fish such as tuna. Oak--Mellow and fresh. Best for meats compatible with strong flavor, such as steak, prk, chicken and salmon. Wood chips are available at some grocery or kitchen specialty stores and can be mailordered from grill manufacturer's supply catalogs. A handful of soaked chips sprinkled over the briquetes just before cooking is a good starter amount for moderate flavor. For use with a gas grill, place wood chips in disposable 6x4-inch foil pans to prevent accumulated ash from clogging vents.